This beautiful Hanukkah dreidel is crafted in the workshop of world known designer Lev Shneiderman. Exquisite design and perfect workmanship, typical for Lev´s creations, are evident also on this small Judaica. 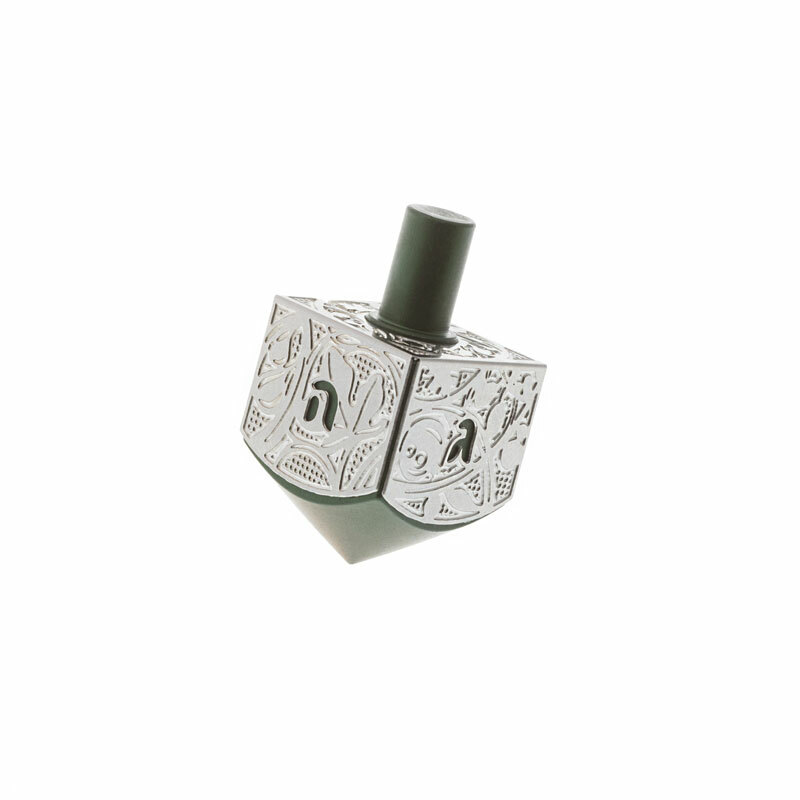 Consider this classic dreidel as a distinct and symbolic Hanukkah gift. This square shaped Hanukkah dreidel is an example of classical Israeli dreidel. It is characterized by harmonious design and precise workmanship. Combination of dark grey color and bright silver colored aluminum plating create elegant contrast. The Aluminum surfaces are decorated by floral ornaments and by cut out letters harmoniously incorporated in the ornamentation. The four letters, one on the each side of the dreidel, are: Nun, Gimel, He and Pei. They render the acronym “Nes Gadol Haya Po”. This small Judaica is a great symbolic gift for kids and for adults. Hanukkah dreidels have been played with during the holiday of Hanukkah for ages. Israeli dreidel is specific for containing the letter Pei, which together with other three letters stands for the sentence “A great miracle happened here.”, referring to the miracle occurred in the Land of Israel. This charming dreidel is created by Lev Shneiderman, world known designer, whose work is recognized also by the President of Israel.